Central processing unit carries out all important functions of a computer. It receives instructions from both the hardware and active software and produces output accordingly. It is also called processer, central processor and microprocessor. It stores all important programs like operating system and application software. It also helps Input and output devices to communicate with each other. Memory: It is called Random access memory (RAM). It temporarily stores data, programs and intermediate and final results of processing. Control Unit: It controls and coordinates the functioning of all parts of computer. It does not involve in processing and storing data. 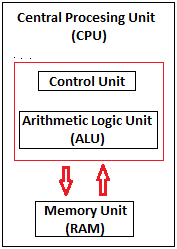 ALU: It performs arithmetic and logical functions. Arithmetic functions include addition, subtraction, multiplication and division. Logical functions mainly include selecting, comparing and merging the data.